neil tan's blog: EXTRA! EXTRA! Interaction Design for Entertainment Website launched! EXTRA! EXTRA! 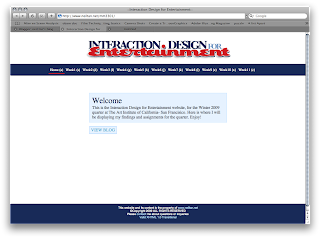 Interaction Design for Entertainment Website launched! Here is the design of my interaction design for entertainment website where I will be posting all my exercises and final project for the class. The blog will still be running with my thought process of all my projects for this class and others. Hey Everyone, I am currently attending The Art Institute of San Francisco studying Web Design and Interactive Media. I really enjoy Video editing or any type of editing as well as design. In the near future I plan to go to Film School and pursue my Masters Degree. I hope everyone enjoys this blog!